Anlong Pi sounds attractive, doesn’t it? Almost a sing-song quality to the words, reminiscent of other beautiful sounding places like Angkor Wat, or Siem Reap. 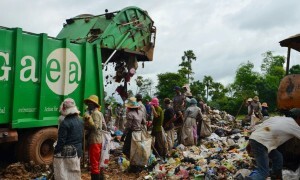 But there the similarity ends, as Anlong Pi is no awesome temple or bustling metropolis, but a stinking, dirty and dangerous dumpsite, where the daily detritus of Siem Reap provides a working and living environment for hundreds of people – women, men … and children. 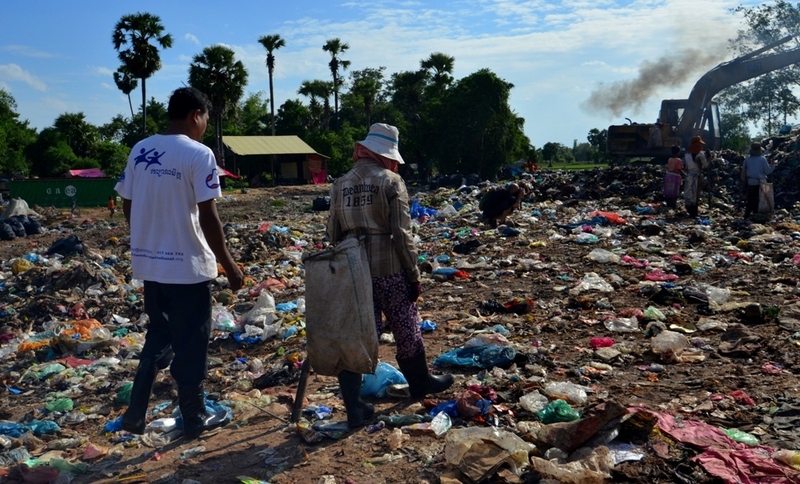 Our Kaliyan Mith Siem Reap (KMSR) team has been working to provide services tailored to the specific needs of those who live and work on the garbage dumpsite there since 2010. 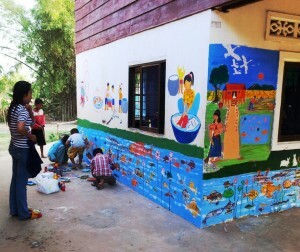 Recently, the staff have noticed many more tourists coming to take photos of the site and hand out food support and money to those who work there. They often come in minivans / buses, and as organized tour groups. 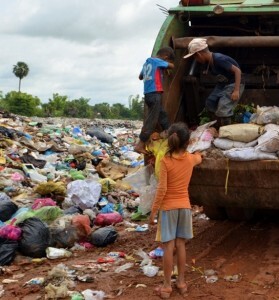 This poses a great risk to our work as families are tempted to bring their children (who would normally be at our preschool / Non-Formal Education or actually in public school) onto the dumpsite to beg. 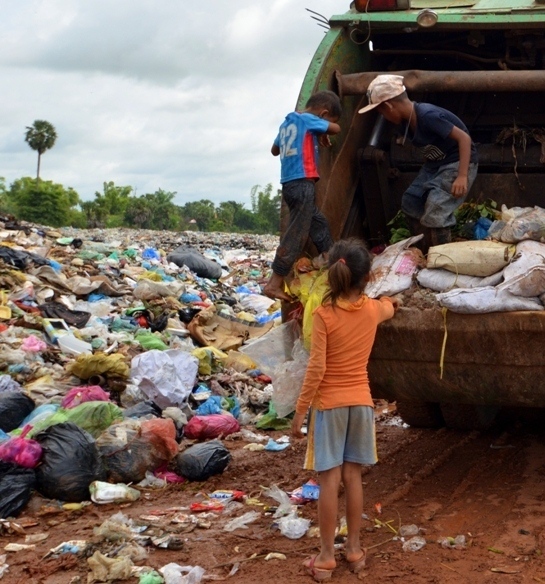 The behavior of these dumpsite tourists may be well-meaning, but not only does it jeopardize our work it actually harms the children we are trying to help find alternatives for. 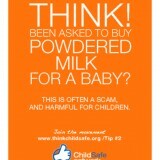 It is another manifestation of the issue we address in our ChildSafe 7Tips for Travelers, Tip #4. So what is KMSR doing for the people of Anlong Pi? Currently the services we provide from our center just behind the dumpsite include 24/7 drinking water, protective gear and hygiene facilities for caretakers working on the dumpsite and life skills education. Other services are a preschool, NFE and school reintegration, school support (one of our key goals for the community is to reduce the number of children working on dumpsite), vocational training and employment, Home Based Production (income generation for caregivers), family case management and facilitating vaccinations for all children under 5 at a local health clinic. Korng is 10 years old and lives with his grandmother and two sisters in Anlong Pi. 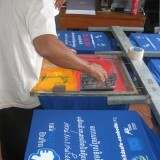 Korng’s family is very poor and his parents migrated to Thailand to find work. Korng was previously studying grade 2 at Ta Ey Primary School in Anlong Pi, but dropped out to help his grandmother to care for his two younger sisters as she became ill. In 2013, Kaliyan Mith social workers met Korng during outreach activities. Korng told them he would really like to go to school, but he was worried to leave his younger sisters alone during the day as his grandmother was too sick to care for them properly. The Kaliyan Mith social workers were able to meet with the director of Ta Ey primary school and negotiate that both Korng and his sisters be able to attend the school. Korng and his sisters were reintegrated to school at the end of 2013. 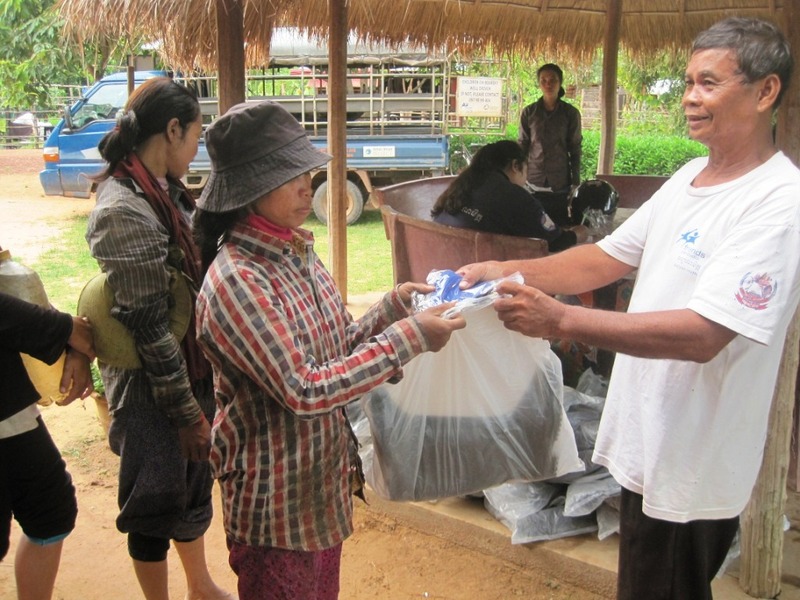 Kaliyan Mith provided school materials, backpacks and uniforms for the family, and the children all attend everyday. Korng is a good student who is reported to study very hard. His parents are extremely happy that all three of their children now attend school. Nita is 17 years old, and the oldest of 4 children. 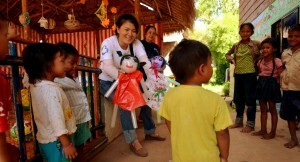 Her 3 siblings are 3-10 years old and do not attend school. As Nita’s parents are too old to work, Nita has had to work on the dumpsite every day from very early to late in the evening, scavenging for cans, bottles and leftover food. At the start of July 2014, a Kaliyan Mith social worker met Nita on the dumpsite and she spoke about her family’s difficult situation. A family case management was opened immediately so a holistic approach could be utilized to address the family’s problems. To stabilize their situation, Kaliyan Mith provided food support for the entire family. This meant Nita did not need to work long hours and encouraged her brother and sister to attend school regularly (which the social worker followed up on). With Nita’s days now free, the social worker opened an individual case management for her and together, they made a plan for Nita to join Kaliyan Mith’s vocational training program so she could learn a skill (cooking) that would ultimately allow her to find employment to earn enough money to support her family members without scavenging on the dumpsite. Nita was enrolled in the cooking training at the end of July and is enjoying it a lot. She hopes to find employment in a famous restaurant or luxury hotel when she graduates. A cut above – the former glue user’s story. A Silver Lining – Playtime (and more) In Siem Reap!